"The particles, called butadiene rubber or “crumb rubber,” is made from synthetic fibers and scrap tires. It raises dust over the fields and smells like, well, former tires. Now, a number of people are questioning the safety of fields that contain those crumbs and an NBC News report cited incidences of cancer specifically among goalies. 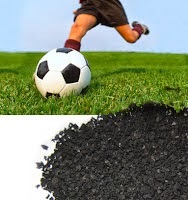 Because of a lack of research, it is not clear whether there is a causal connection yet, but it’s a question worth exploring because the material can contain benzene, carbon black and lead and it’s prevalent on the soccer fields at schools and parks across the country. The turf is the latest iteration of the artificial playing surface, one that carried the promise of a softer impact for athletes — important in an era of increasing awareness of the dangers of concussions.